WW1 Memorial Wall, Washington DC. Tell us about what you are creating for the new National World War I Memorial in Washington DC. Tell us about your particular part of this big project. 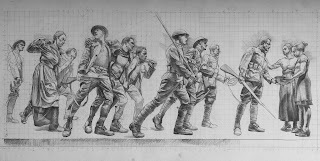 Since Thanksgiving, I have been involved in composing and drawing out the final iteration of A Soldier's Journey. I went through at least a dozen iterations with Centennial Commission, led by Edwin Fountain. By photographing young men, and women dressed in authentic World War I uniforms, I came up with many options for each of the sections of the processional relief. What developed from my countless hours of posing models is a story that would excite the general public and also explain World War I in a way that makes it meaningful to your every day memorial visitor. From the images and scenes that I collected, I would then translate the individual poses and figurative groupings into drawings. We are experiencing a rebirth of interest in the figure. This renewed interest has been brewing for at least the last 15 years all over the world, with young artists taking classes in private studios called ateliers. Most of the work is about learning the technique of recreating the figure in a realist fashion. It relies on photography as a reference model. It often doesn’t talk much about the philosophical implications of the figure. In art, the philosophical implications are described by the construction of form, and how things are assembled structurally. Because I am a sculptor, I extrapolate a three dimensional approach that has a tactile sense in how the forms are pitched towards the light. The sense of force, luminosity, and structure become strong elements in this construction of the figure. Ultimately this project is not about the technique of creating a multi-figure composition. It is about using a medium or technique to deliver a message. My drawing work is strictly based in three components of construction. There is the scientific anatomical element that deals with the gesture of the architecture of the figure. This is the skeleton. There is the second scientific anatomical element that is the musculature of the body. This deals with how forms push out into space, giving a sense of expansion. Lastly how these two elements of skeleton/architecture and musculature/energetic spirals are combined in a proportionally rhythmic and dynamic fashion. This construction creates a unified hierarchical system where all the components fit within the whole. I have always looked at translating the life model in the studio with an eye to these conceptual elements. I don’t rely on photography as an indicator of realism. Rather, I look at the figure as an architectural organic structure that has to be translated from life into an art form. Photographs are just a launching point. They don't have the three-dimensional nature that I have to bring to the art in my process. Yes, I have a way of working that is figurative, but it's also extremely abstract and conceptual in nature. It gives the figure a sense of belonging to something bigger than just this reality. It gives the sense of a sacredness of importance. The act of creation for me is an active transformation from life model or reality into art form. Perception creates reality. When I work, I am seeing something that is very three-dimensional and full of force. That is what I bring to the drawing and sculpting. By having a geometric construct in mind when I look and draw out my figures, there is a very different end result. Picasso said, “To tell the truth, you must tell a lie." Once Edwin and I had established how to tell the story with almost 40 figures across a 75 foot long wall, I had to take that composition and translate it into a single tableau. To create that image, I subdivided the full composition into three sectional drawings, a beginning, middle, and an end. Edwin came to New York for a final meeting in my studio where he took a red pencil and drew comments about how he wished to see the storyline unfold. In the next 72 hours, I regrouped in my studio the five WWI models and reshot three quarters of the full composition. Most of the shots involved a maximum of three figures grouped together with some single figure poses. From these individual pictures, I was able to put together larger groupings. From these larger groupings, the composition resulted in five scenes. This subdivision transitioned into three acts or three stages of beginning middle and end. This is a very classical way of working where there are many parts but all those parts fit together in a unified, harmonious way to make the whole. What, in life, prepared you for this project? There are certain rhythms that exist in nature. Those rhythms have been documented as having mathematical curves and proportions. Those mathematical compositional elements of design can be found in classical art and it reached an apogee in Renaissance Italy. The foundation of my education stems from studying this type of art form and playing it forward in a contemporary and modern context. I have always worked with life models as my primary reference. As an artist, I translate everything through my perception. Art is the translation of how an artist perceives things. Each human being perceives the world in his or her own unique fashion. There is a general consensus of how things are, however visually when we look, our perception is strongly influenced by our education. My education stemmed from Walter Erlbacher, a German teacher that came out of the Bauhaus school. From him I learned a methodology of sculpting that went back to the figurative anatomical writings of Leonardo and Pollaiolo, both Italian Renaissance Masters. His wife Martha, taught me how to translate form through the use of light in drawing. My education continued in Rome in an apprenticeship with Paulo Carasone bringing me a new knowledge in sculpture from Greco-Roman portraiture about unity and rhythm in figurative sculpture. Because the last few months had been so crammed with work, a certain flow and confidence developed in the studio. And from this confidence, I began to take risks and chances in developing the composition that brought a higher and fresher energy to the poses and composition. In one ear, I listened attentively as Edwin told me, “This is what I want the story line to be.” In my other ear, I listened to guidance from the historical Masters of Renaissance Italy to construct something that would play forward the story line in a forceful,dramatic and meaningful way. There is nothing archaeological about this art form at all. When I am drawing and doing this translation from the reference, my mind is completely focused. I do not bother playing music because I don't hear anything. I am in the moment. I am not thinking about how the end product should look. I'm completely in the process. There is a seriousness to the creative process. It’s about looking at art in a way that is sacred. It eliminates much of the irony that modernism has presented, irony that has become stale and over-played. The cutting edge of art, the avant-garde, lies in art that is resonant with meaning, art that comes out of beauty, excellence, and the artist’s skill. My job from the beginning of this project has been to put a visual face on a war that occurred 100 years ago in a way that would interest the public. The visuals drive the concepts. Yes, my creative process is full of conceptual information, but it is there first and foremost to create an art that is 100% visual. Art today has become strongly dependent on conceptual ideas and form has taken a lesser role since 1920. 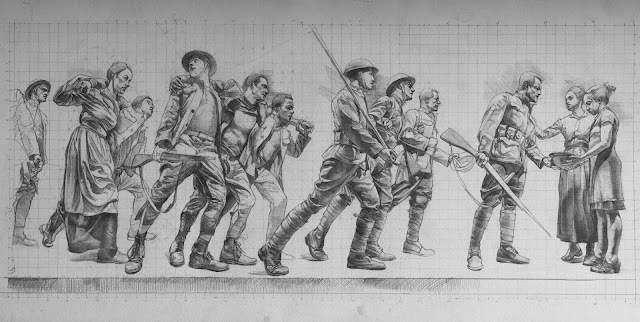 This change in how the figure has been seen abruptly ended in art schools just as World War 1 ended.. This is not coincidental. There is a change in the general psyche of the world at that moment. It feels appropriate to create a memorial that harkens back to an era that still believes in the sacred. And in many ways this is the next wave of art as it proceeds forward always reinventing and re-creating itself in a fresh new light. How do you create a memorial that stimulates the public to do a double take when they see the art? It is imperative to create something that everybody can understand. Yes, there can be hidden meanings, but first and foremost the visuals must relay the story. The story must carry a sense of drama and theater to convey feeling. We all understand emotions. It is how we travel through our lives and make sense of our world. It is my job as an artist to create a visceral memory of what World War I was like. The art carries an emotional truth and energy that people can appreciate and understand, and in that understanding an emotional reaction is created in the visitor. From that emotional reaction an interest in knowing more about this forgotten war is sparked. These feeling help tell the story on a personal level. As I developed A SOLDIER”S STORY, this one soldier’s voyage has come to represent on a deeper level what transpired for America both at home and globally. All this is contingent upon the level of the art created. There can be no glitches in the flow of the composition. The structure of each of the individual figures must be solid by itself and transition well into the figures that surround it. There is an underlying architectural structure to the full composition. An X passes through the very center of the composition connecting all of the figures to the core. The symbol of X has meaning of transformation and change. The Memorial must have a story that is universally understood, it needs a uniqueness in its artistic vision, and must be created at the highest level artistically. I wish to create something that is shocking but not shocking in the modern sense, but Shockingly beautiful!